You’ve got big dreams, goals, and aspirations that can make you feel two ways, (1) like you can climb any mountain and (2) like how in the world am I going to accomplish that?! It’s completely normal. Your big dreams and goals should create a sense of intimidation, overwhelm, or anxiety because if your dreams aren’t scary, then they are not big enough. Having those feelings are a good thing and definitely a good sign that you’re in the right direction of your goals. But what do you do with all those ideas, dreams, and goals that you want to see happen one day? Create an accountability system for your goals. It’s the ecosystem you create to reach your goals. It’s an environment that is conducive for setting the proper goals with all of the right elements in place and facilitates measured progress towards the desired outcome. 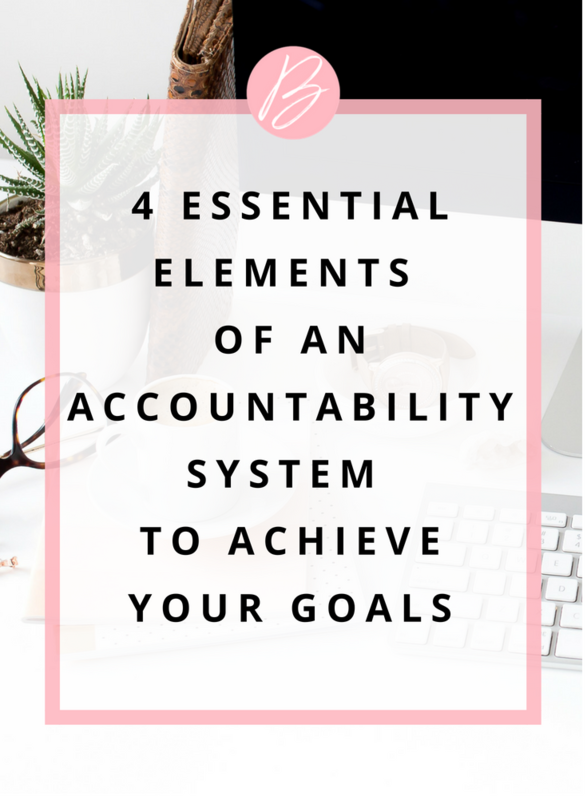 I want to share with you 4 essential elements to creating an accountability system to reach your goals and thrive in your purpose. Without you, the system would not exist, but you alone can easily lose sight of the goal or task. Seek out a coach as an accountability partner to help you have the right balance of mentorship and objectivity. Your accountability partners should be someone you trust and will give you honest feedback. An accountability partner will help you keep objectivity in sight. Professional athletes need coaches because they need someone to see what they are doing from a perspective that they are not able to see. A coach can provide you the same value by identifying your blind spots and give you ideas for how to be more efficient or productive in your actions. Creating an action plan will help you decide how you will reach your goals is crucial. This is where you have to be intentional and purposeful in knowing what action steps you are going to take each day or however often you decide to accomplish your goal. The action plan helps you stay focused on each step in the process, it brings more clarity to your goals, helps you stay connected and aligned to your purpose, and prioritizes each step in the process. Action plans should motivate you and help you stay committed to the process. Motivation and commitment can sometimes drop because sometimes it’s difficult to see your progress or maybe you feel like it’s just not going to happen or it’s going to take forever. Don’t wait to celebrate the end goal. Celebrate you and all your hard work throughout the process. Determine what you celebration milestones will be and how you will reward yourself along the way. Add balance and self-care into your action plan. This is the most overlooked part when creating the roadmap to reach your goal. If you just grind and hustle the whole way through, you might lose the joy in working towards your goal. I believe that we should be able to experience joy in each process we create to accomplish our goal, but if you’re not intentional about it, it may become lost and your most precious asset, which is you, can become worn and unfulfilled. Making time for you as a part of your action plan keeps you mindful that you have to take care of you and that you are more important than the goal you are trying to reach. When you do this, you won’t feel guilty for taking the night off to treat yourself or slowing down just to get a little rest in. Most of all, the date you set for your goal is more realistic because you’ve incorporated balance and self-care into your action plan. Your goals must reside somewhere other than in your mind. As much as I love technology, I’m a big believer in writing things down. Designate a journal for your goals or use an online app to document your goals. I like to use both. I always start on paper and then use an online app like Asana to track them. Put your goals on your phone, a notecard, post-it note and place them somewhere you can easily them every day. Let’s admit it that life just happens and things don’t always go as planned. In order to know how well you’re moving forward, take the time to reflect each week or biweekly. You don’t really know if your action plan needs a bit of tweaking unless you reflect on how you think you did in working towards your goal, what you could have done smarter, quicker, or maybe not at all. Schedule time to work with your coach to identify any areas where you may need more help and stay motivated. There’s nothing like having a coach champion and inspire you along the way to help you reach your full potential and thrive in living out your purpose. To help you set your goals and action plan, I've created a free Goal Tracker and Action Plan. You can easily set your goals, create your action steps with intention and purpose. Click the button below to download. I'd love to hear your thoughts about what you use to set up an accountability system to reach your goals. If you need help getting started, schedule a consultation here.